Snowmobiles are to dog sleds what motorboats are to sailing boats or motorbikes are to bicycles. 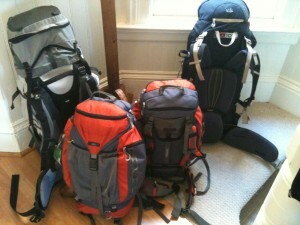 The speed is exhilarating, but they are noisy and bumpy and smelly. We drove our snowmobiles on both tracks and deep snow and the later was by far the best. The early track out of Saariselka is very, very bumpy and it was pretty unpleasant being the driver; poor Callum and Declan were riding pillion and were thoroughly shaken and stirred. Later, though, we rode smoother tracks and then, eventually, deep snow and that was much smoother and so more fun. Making a hole for ice fishing. The best bit was when we turned a corner and startled some reindeer on the path. They ran alongside us for about 500m until they were spooked enough to leap off the road and into the forest. Our destination was a long, and by long I mean it runs almost to the Russian border, lake where we tried ice-fishing. 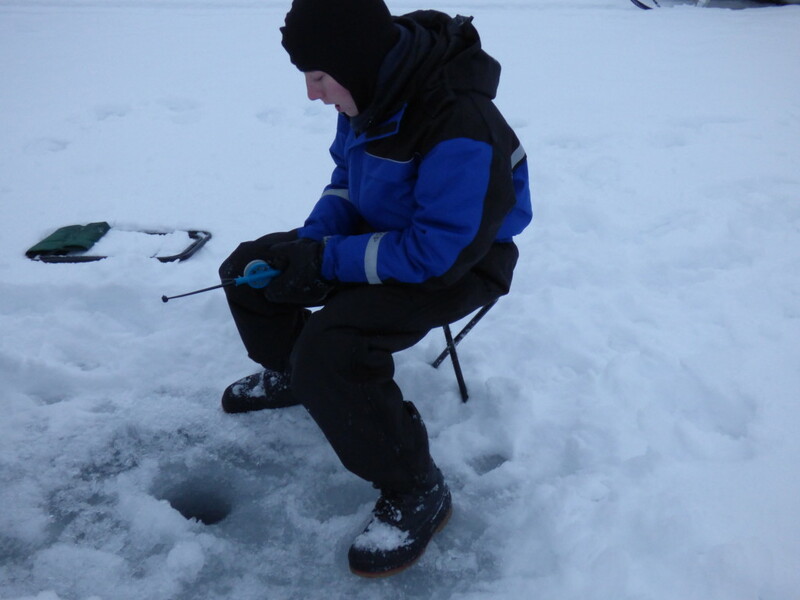 The best part of the ice-fishing experience was drilling the hole. 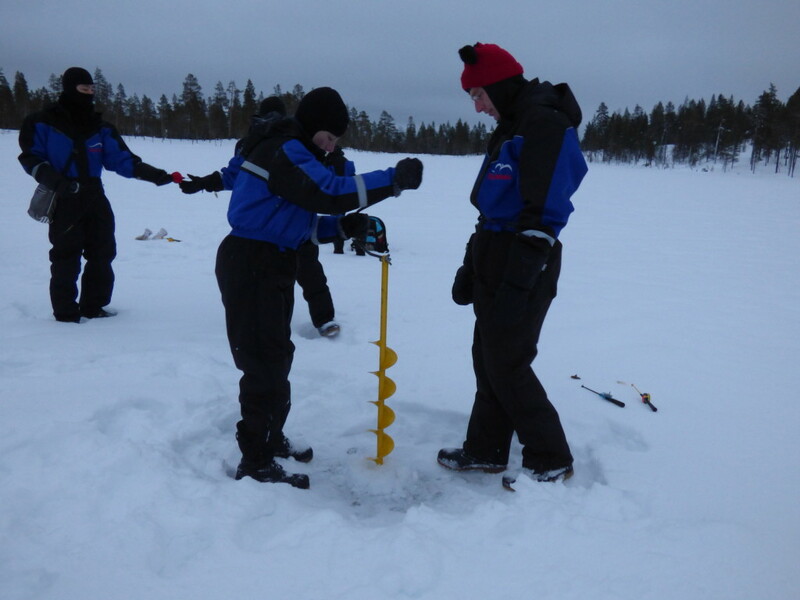 The ice is about 50cm thick and you use a long hand drill to make a hole all the way through. You then scoop out any floating ice and drop a fishing line through. The fishing bit was less exciting, we spent about and hour-and-a-half in the freezing cold not catching any fish. It is worth noting for posterity that this was only the second time the boys have been fishing. The first was fishing for piranhas in the Amazon. Given that’s been followed by ice-fishing in Lapland, we’re going to be stretching to continue that trend. By the time we drove on to a nearby hut and had a lunch of reindeer burger and hot berry juice we were all quite thoroughly chilled. The drive back was in the dark. When we also hit fog on the high tundra, the snowmobiling was very like a video game – all you could see was a little tunnel of light with obstacles hurtling towards you and 40km per hour. The difference between reality and a game was in the physical effort needed to keep the snowmobile on track. Because steering is done by turning the skis at the front and because the vehicle slides a lot you need to do a lot of hard pushing. Jennifer and I and both feeling the muscles in our backs this evening. We all agree we’re glad we did the snowmobiling but we won’t be rushing back.